A red light always means stop. You must wait until the green light shows before you can proceed. A police officer’s directions can overrule a red light. Unlike in North America, there is not a free left turn. A green light means you can go, as long as it’s safe to do so. This image shows a green filter light to the right. This is most frequently seen where two lines of facing traffic want to turn to the right. Both directions can turn right without interfering with each other’s trajectories. 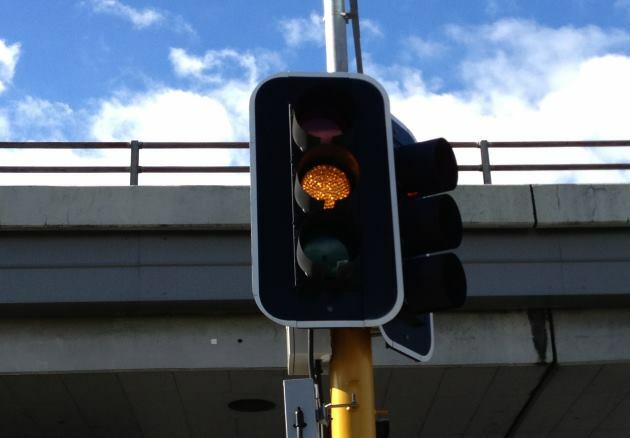 This amber or yellow traffic light comes after a green light and indicates that the lights are just about to turn red. You should stop if it’s safe to do so, and this will vary according to the road conditions, the braking ability of your car, and the ability for people behind you to stop. Give way to the right on roundabouts. The length of time that the yellow light displays depends on the speed of traffic through the intersection. A typical yellow light in an urban area lasts for approximately four seconds. We timed several downtown Auckland lights to come up with an average of 3.8 seconds. In the UK, yellow lights are 1 second per 10mph (16kph) speed limit. Using the same logic the equation would be 1 second every 13.2kph at least for the amber lights we measured. Red and green traffic lights have variable phases, depending on the intersection. More roads joining the intersection will mean a longer red phase. A minor road entering a major intersection could have a very short green phase because there might only ever be one or two vehicles waiting at any one time, whereas a large intersection with a main road passing through it could see very long green phases on the main road. After your light goes red, all lights will be red for a short amount of time to allow vehicles to clear the intersection, then one of the other lights will turn green. Other drivers don’t get a green light the moment your light goes red. 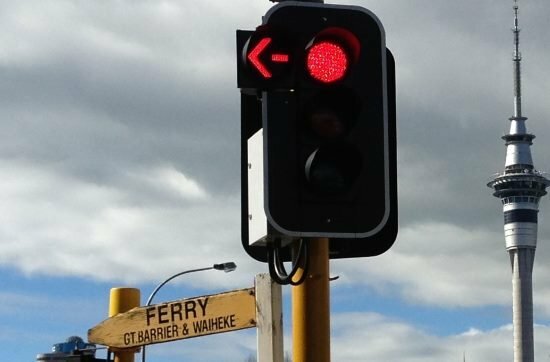 The other time when all the traffic lights will be red is when pedestrians have their own dedicated phase and cross in all directions. Delays caused further back up the road have caused drivers to be late. The yellow light that precedes the red light displays for around 3.8-4 seconds in urban areas, therefore you have plenty of time to stop before the intersection if you are not in a position where you would have passed through the intersection completely should you hold your speed steady. 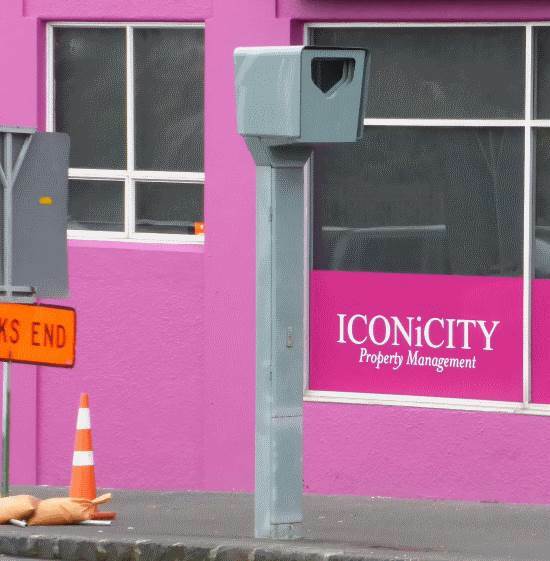 Some intersections are covered by a red light camera such as the one pictured below. They use sensors in the road to detect if a vehicle proceeds beyond the give way or stop line after the light has turned red. If you are already in the intersection when the lights turn red, then you won’t trigger the camera. Traffic lights have shields around the lights to make them clearer in bright sunlight and to prevent drivers other than those looking directly at them from seeing which colour they are (which could be confusing for them).